A decade ago, Ishmael Butler-the architect of the groundbreaking but long-disbanded hip-hop group Digable Planets-was preparing at last to emerge from years of near-complete silence. He unveiled his new outlet, Shabazz Palaces, in the summer of 2009 through a pair of self-released EPs, surrounding his hyperlinked verses with webs of psychedelic textures and refracted rhythms. From the start, confidentiality seemed essential: Butler wanted Shabazz Palaces to stand on its own strength, not his outsized reputation, so he adopted a nom de plume for himself. As the project's network expanded, though, he needed new monikers for his partnerships. 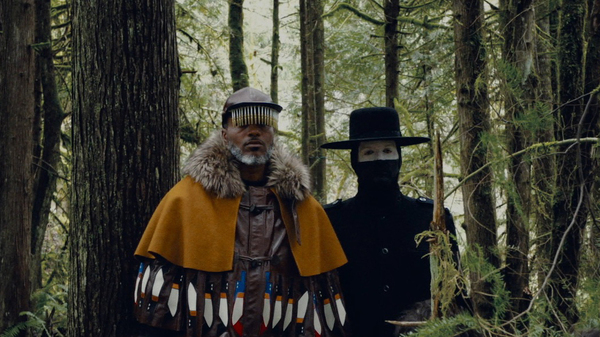 Knife Knights is the name he gave to his work with Seattle engineer, producer, songwriter, and film composer Erik Blood, a vital force in the Shabazz Palaces universe. Now, after more than a decade of collaboration and the development into of a rich friendship, Butler and Blood have made a proper full-length record together as Knife Knights: 1 Time Mirage, an eleven-track odyssey that finds the pair and a cast of their friends weaving together a singular world of soul and shoegaze, hip-hop and lush noise, bass and bedlam. 1 Time Mirage represents a playground for Butler and Blood, a free space for unfettered exploration, and a radically adventurous start to something much more than a mere production duo or side project. Butler and Blood met in 2003 at a Spiritualized show in Seattle, introduced by a mutual friend who was soon set to record Butler in his studio. A Digable Planets zealot, Blood was floored, passing a bootleg copy of Blowout Comb to his friend for an autograph (which Butler dutifully provided). For the next few years, they'd run into one another by chance and sometimes make small talk about working together. When Butler finally sent him a few tunes to mix, the kinship seemed obvious and immediate. Though Butler had grown up as a hip-hop student, he'd started absorbing shoegaze rock and ambient soundscapes, too. Blood, meanwhile, was an ardent hip-hop fan who had always been an inclusive listener. On every Shabazz Palaces album, Butler and Blood have delighted at that artistic intersection, constantly indoctrinating hip-hop in new worlds of sound. "He takes my ideas and clarifies and pronounces them, helps me realize them," explains Butler. "He helps me get to the essence." Recorded in three fertile sessions interrupted by Shabazz Palaces tours and Blood's recording projects, 1 Time Mirage is a profound fulfilment of that partnership, realized at the crossroads of Butler's and Blood's mutual enthusiasms. Their shared interests have been split into pieces and fused together with enviable imagination. Take "Give You Game," where Butler and Blood weave their distant voices through a landscape of synthesizers and drums that bubble up sporadically, like geysers. Marquetta Miller and THEESatisfaction's Stasia Irons soon join, their round tones lacing around those sounds and giving them shape. It is an abstract anthem to astral love. "Low Key" suggests a radiant daydream, with kaleidoscopic synthesizers and faded harmonies pirouetting over puzzle pieces of dizzying percussion and understated funk. "Can't Draw the Line" rushes headlong like some narcotized disco fantasy, with its four planted firmly on the floor but Butler's breathy voice and an armada of synthesizers stretching skyward. They splice doo-wop harmonies to scattered dub rhythms during "Light Up Ahead (Time Mirage)," hard-edged verses to industrial din during " Mr. President." Colossal drums puncture walls of labyrinthine noise sculpted from deranged synthesizers and mutated guitars during "Seven Wheel Motion," an absolute powerhouse. Butler seems to rap in dialogue with himself, detailing a threatening streetscape and shaping the experience into personal realizations. "Smooth landings, queens in tandems, cash in grand sums," he declares at one point. "Life is random/I roll the dice and bet on me." In the decade since Butler launched Shabazz Palaces and first christened his partnership with Blood as Knife Knights, much of that project's external mystery has, of course, fallen away. And 1 Time Mirage is a very public step forward for the pair. That early sense of secrecy has given way to a spirit of friendship and creative candor, to the doors of experimentation being thrown open by old pals thrilled by the prospect of testing new ideas. Still, these eleven songs retain a core of intrigue and, indeed, mystery; each listen reveals yet another connection between infinite and interlocking pieces. To wit, Robert Beatty's brilliant cover for 1 Time Mirage depicts a futuristic vehicle, being coolly steered with one hand into some great, mildly ominous unknown. That's how these songs feel, too-confident conquests of the dark that unlock sounds and spaces you have yet to imagine.